Synopsis: From acclaimed author Katie McGarry comes the explosive new tale of a good girl with a reckless streak, a street smart guy with nothing to lose, and a romance forged in the fast lane. The girl with straight A's, designer clothes, and the perfect life - that's who people expect Rachel Young to be. So the private school junior keeps secrets from her wealthy parents and overbearing brothers...and she's just added two more to the list. One involves racing strangers down dark country roads in her Mustang GT. The other? Seventeen-year-old Isaiah Walker - a guy she has no business even talking to. But when the foster kid with the tattoos and intense gray eyes comes to her rescue, she can't get him out of her mind. Isaiah has secrets too. About where he lives, and how he really feels about Rachel. The last thing he needs is to get tangled up with a rich girl who wants to slum it on the south side for kicks - no matter how angelic she might look. But when their shared love of street racing puts both their lives in jeopardy, they have six weeks to come up with a way out. Six weeks to discover just how far they'll go to save each other. 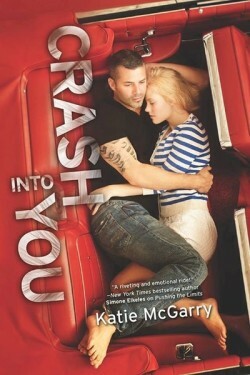 Crash Into You sees McGarry’s third and final return to Noah and Echo’s world of crime, poverty and drugs, this time to tell Isaiah’s story, whose life is changed forever when a beautiful girl arrives to an illegal street race, completely out of place. The only way for him to save her is to put his own reputation in the firing line – but as things get more and more complicated, is it worth it? Unlike Pushing the Limits and Dare You To, Crash Into You opens with a huge explosion of high-octane action as both Rachel and Isaiah take to the streets in an illegal drag race. It’s incredibly powerful, and the subsequent car chase is fit for any James Bond film. But it’s not just high-stakes danger that makes this an addictive start; it’s also the sexual tension, which you can almost feel crackling in the air between the two. Extremely well executed, McGarry knows exactly what she’s doing in every scene and keeps the reader on tenterhooks for a good quarter of the novel in the lead-up to its first emotional peak. Subsequently, there is a slight lull as she pulls out of it, but even that is engaging and drives Crash Into You forward into its inevitable, well, crash. Part of McGarry’s success is that she is extremely capable at creating sympathetic characters that the reader can attach to from the very beginning. Rachel, in many ways, is a strong lead who is treated like a baby by her family; she has to shoulder the burden of keeping her mother sane and replacing her deceased sister. Isaiah, who gets more development later in the novel, has an equally poor home life, though for different reasons: he’s been in fostering since he was six and hasn’t seen his mother for over a decade. Both come from completely different backgrounds – rich and poor – but are united by their familial problems. As with the previous two books, there is a sense of emotional manipulation on McGarry’s part – is it even possible that so many things can go wrong?! – yet her story is so powerful, particularly in emotional terms, that you just can’t help going along with it. If anything, McGarry is perfect at pacing her highs and lows and abuse her readers’ emotional investment! Equally, her prose is incredibly visceral, and I had a great feel for the novel in visual terms, which evoked a sense of dark and light. More than the previous two, Crash Into You is almost written for the big screen and I’d be very excited to see and adaptation of it. This is McGarry’s third, and best, novel so far and it’s well worth a read, even if romance isn’t normally your thing; Crash Into You is dark and gritty, and this isn’t a frilly love story with lace but a passion between two damaged, broken teenagers.